Clove essential oil, Super, ECOCERT, Madagascar has a spicy, pleasant aroma. It is warm, sweet, peppery and candy-like. The scent is similar to the common household spice. With a stimulating and revitalizing aroma, it makes a great oil to diffuse. 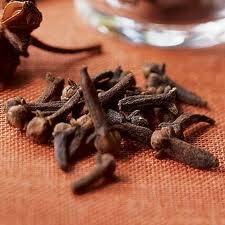 Clove oil has wonderful immune-stimulating features. It's common and most remembered use is in the dental industry to numb gums. Clove Bud has a high Oxygen Radical Absorbance Capacity ORAC, exceeds 10 million. Many professionals hail it as a major cancer fighter. It is also good for dental problems and in fighting contagious diseases. Rubbed in the area of the prostate has reduced PSA for many. The chemical constituent Eugenol kills tuberculosis bacillus. Clove oil is made from the buds of the flowers of a tree that grows in tropical to Equatorial regions: Madgascar to Sri Lanka and Indonesia. It is an intense oil, most commonly used to relieve dental pain and infection and to dissolve the eggs deposited by intestinal worms. It is delicious but overwhelming in both smell and taste. It is antiseptic, carminative, warming, and very aromatic. It is often used as a flavoring in toothpaste, mouthwashes, and exotic foods. Clove oil can be mixed into dental powders and toothpastes. A preferred use is to add a few drops of clove oil to an ounce of a high quality cooking oil or coconut butter or, if available, black cumin seed oil. Diluted like this, clove oil can be applied directly to the gums or toothache. Another method is to fill a few (not many because the oil can dissolve the capsules) "00" vegetarian gelcaps and take one or two capsules a day to relieve flatulence and noxious odors in the digestive system. Peristalsis is also aided by this use. Ayurvedic practitioners simply put one drop into a glass of water and sip the water slowly.